Thanks for liking my squirrel post 🙂 Have a good one, and keep making comics! Thanks for visiting my blog– so glad you liked it! I’m stoked to discover your work…these guys are lots of fun. Thanks for visiting (and liking my site)! Been havign a look through your comics, they’re a fun read 🙂 drop by again soon! thanks you have some fun stuff on your blog, mr. pumpkin head. i like your style. Thanks for liking my Spirit Collages. Your comic images are very fun. Have a wonderful day! your Spirit Collage is really interesting. it makes me wanna try one myself. thanks for visiting us too. Hey, would you happen to sell prints of your work at all? Let us talk about it and get back to you. What were you thinking about? Hey Irene, I don’t think we are going to get into the business of selling prints. However, if you would like to make a copy and print yourself you have our permission. (Because you asked) There are some cool websites that make prints from files on card stock or canvas and what not. Maybe you could even find bamboo paper. Thanks for asking, and sorry it took so long to get back to you. Thank you so much we will check it out. Wow. Thank you so much, Kelly. We love your art work. We’re very happy to receive One Lovely Blog Award from an artist like you. Hey! Thanks for visiting my blog. You have great stuff up here. Keep it up. thanks 🙂 you have a great collection of funny stuff too! Your welcome and thank you for the kind words. Thanks! You have a lot of cute stuff on your blog! Hey thanks for the like on my Blog 🙂 although it woulda been cool to actually learn of the creators of this blog rather than the mysterious notions thru the characters you make comics about. Thanks for the comment. We prefer to remain mysterious notions. But we are sorry for the inconvenience. Hey you got your reasons..but just saying you got a good thing going seems like you’d want people to know. But I guess not. No inconvenience on my end I’m still a follower. 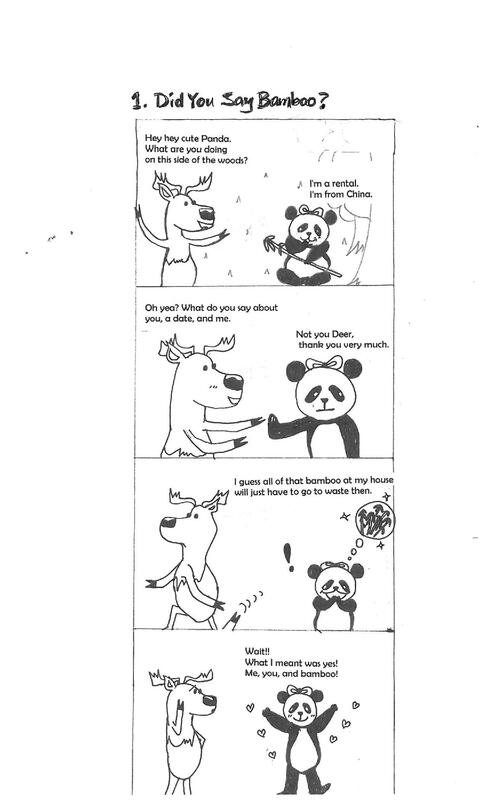 Love the Panda and Deer! Congratulations. I just nominated you for the “Liebster Blog Award” ☺ check out http://vivianesview.wordpress.com/2012/10/01/vivs-view-nomination-for-liebster-blog-award/ for more info on the award. Thank you so much for the award. As we are approaching Panda’s election we may be a bit busy in the next month, however we will try to accept your award in a timely manner. Wow, you’re a talented cartoonist, these are great! Awesome stuff you’ve got here going on! Great job, I’m signing up so make sure to make me laugh (and ponder for a moment too) from time to time…. Thank you! You have many cool projects on your site. I can learn some creative ideas from you. So you’re playing with paints and varnishes as well?? Yes, but not as complicated project as yours. I love your wooden box the clock theme. It’s so beautiful! Mucho gracias for your like. Tis very much appreciated! You’re welcome. You have a lot of interesting (and pretty) stuff on your site. Hi, thanks for liking my pottery post. What a great blog you have. Love the panda resume and the comics – my transdaughter is a big fan of Carl Sagan! I think your stories are cool and the illustrations fantastically cute and funny! Thank you so much. We choose to accept. Though please be patient with us since we are very slow typers. Hi, thanks for the like on my comic… I like your comics too, I am just getting started on mine. hey, sevenlegged, are Panda, Deer & c. still alive? Actually today. I hope all is well Marco. Well, almost four years passed by. 7legged, are you still around there?